Fresh from a successful international competition season, the 2018 Fischoff National Chamber Music Competition grand prize winner the Callisto Quartet returns to the Leighton Concert Hall at the DeBartolo Performing Arts Center, for a chamber music concert on Sunday, October 28 at 2 p.m. The performance is a progressive program of selections by Joseph Haydn and Franz Schubert, and contemporary works by living composers Thomas Adès and Francisco Coll. The Callisto Quartet was formed in 2016 at the Cleveland Institute of Music (CIM) and brings together four dedicated and passionate musicians who share a love for chamber music. The quartet was a prizewinner at the 2018 Wigmore Hall International String Quartet Competition and is the only American quartet selected to compete in the 2018 Melbourne International Chamber Music Competition. Their Presenting Series performance is made possible by the Charles T. Morse Endowment for Excellence in the Performing Arts. The quartet is based at CIM and works primarily with Si-Yan Darren Li and Peter Salaff. They have also had the opportunity to play in coaching and master classes for Elliott Antokoletz, Noah Bendix-Balgley, Mathieu Herzog, and members of the Alban Berg, Belcea, Danish, Escher, Vermeer, and Ying Quartets. The Callisto Quartet was selected as the CIM Apprentice Quartet for 2017, a position which includes extensive education and performance activities throughout the Cleveland community and a recital on the Cleveland Chamber Music Society’s concert series. They are also featured as ensemble-in-residence at the Carolina Music Museum in Greenville, South Carolina. 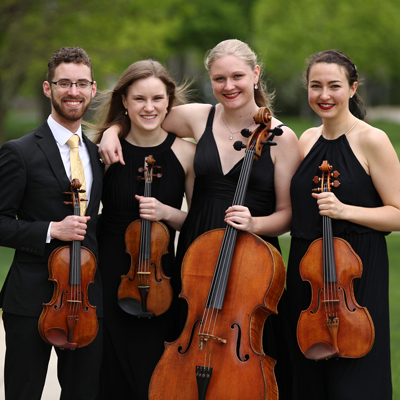 In the summer of 2017, the quartet received a fellowship to study at the Norfolk Chamber Music Festival with members of the Brentano, Miro, and Emerson Quartets. They have also attended the Juilliard String Quartet Seminar, the Robert Mann String Quartet Institute, and the McGill International String Quartet Academy. In April 2018, they attended the Prussia Cove International Musicians Seminar where they were invited to study with Gerhard Schulz, and in September 2018 they will attend the Jeunesses Musicales International Chamber Music Campus in Weikersheim, Germany as part of their prize from the Wigmore Hall Competition. Performances this past year include an appearance with David Geringas at the Cleveland Cello Society’s 20th-anniversary concert and a collaboration with pianist Gilles Vonsattel at the Great Lakes Chamber Music Festival, where they participated in the 2018 Shouse Institute. They are looking forward to their New York City debut recital on the Schneider Concert Series in December 2018. Sunday, October 28, 2018, at the Leighton Concert Hall, DeBartolo Performing Arts Center.